A site, between University Street, Rugby Road and Magdala Street, currently the subject of the following application (24 August 2018) for planning permission “LA04/2018/2192/F Conversion, alteration and demolition of rear return of former office building to 6no. 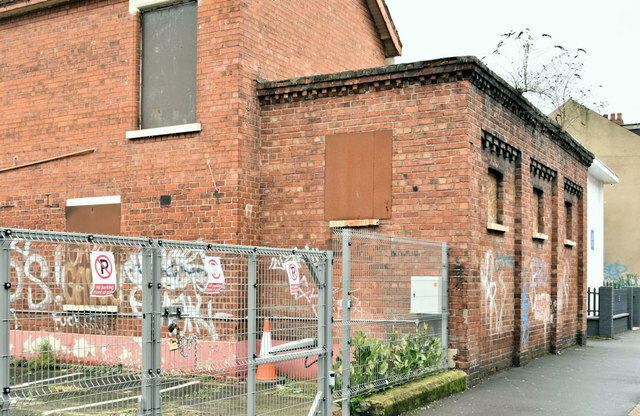 apartments and construction of 31no apartments, parking and associated development (amended scheme) Land to the west of and including no 81 University Street Belfast BT7 1HL”. I have no connection with the proposed development and express no opinion about the application. I cannot enter into correspondence. ”In 1976 Queen’s unveiled a new piece of kinetic sculpture built by staff and students from the School of Mechanical Engineering and located near the Botanic Avenue entrance to Belfast’s Botanic Gardens. It became a well-loved landmark even after its moving parts had seized and rusted and great sadness marked its eventual removal in 2005 to make way for the Sir Anthony Reilly Library. Industry, as the piece was known, was the largest work and only piece of public sculpture by its designer, Barry Orr (1930-2000). Born in Eglantine Avenue, Belfast, he attended Methodist College and worked in the textile industry and as an entertainment booker for the Talk of the Town nightclub in Belfast. He eventually became Press Officer for UTV and then Enterprise Ulster. Although his work is included in many public and private collections, Orr never considered himself to be an artist, describing his kinetic pieces as ?mechanical doodles?. He was inspired to make the first of these when he discovered that his teething child was soothed by the sound of dried peas in a tin and rather than continue to shake it manually, he built a machine to do it for him. Orbs work is part of the art historical tradition of improbable machines and has an obvious affinity with the famous drawings of William Heath Robinson (1872 ?1944) the English illustrator, whose name has entered the language as a description of any unnecessarily complex and implausible contraption. Heath Robinsons machines existed on paper and functioned only in the imagination. A more direct influence and a personal hero, was Frederick Roland Emett (1906-1990), another English cartoonist and constructor of whimsical kinetic sculpture, amongst whose most famous works were Nellie, the steam locomotive constructed for the 1951 Festival of Britain and one of its most popular attractions, and Professor Potts? elaborate time-saving domestic devices for the 1968 film Chitty Chitty Bang Bang.